In our last article we learned that engraving was the method of choice for printing early Canada stamps. However, in the 1950’s, Canada Post also introduced printing by lithography. While lithography has been around for a long time, it was only in those years that it started becoming really popular in commercial printing-mainly because it was fast, less expensive than engraving and produced a crisp, clean image. One way lithography differs from engraved printing is that it is a « planographic » printing method. In other words, printed from a flat or smooth printing plate surface, as opposed to the recessed, grooved lines that engraving produces. Lithography is based on the principle that oil and water repel each other. Basically, some parts of the printing plate are covered in water, while the parts of the plate that carry the design are covered in ink. How does it all work? –the aluminum plate is then wrapped around a cylinder and the plate cylinder is placed in the printing press. The plate cylinder rubs against rollers moistened with a water-based solution and water is transferred and adheres to the non-image part of the plate. The water does not stick to the emulsion that carries the image. 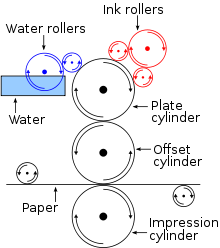 –the cylinder also comes into contact with rollers saturated with special hydrophobic ink (ink that is repelled by water). So, the ink sticks to the ink-receptive emulsion that the image has been developed onto, but not to the water coated non-image parts of the plate. –the inked plate now transfers the inked image to the « offset cylinder » (a cylinder that has a rubber sleeve around it). The image on the offset cylinder is now in reverse. –paper is now run in-between the offset cylinder and an « impression cylinder », a cylinder which presses the paper firmly against the inked offset cylinder, thereby transferring the image to the paper. The image on the paper is now a positive image. –an aluminum plate is developed with the design elements for each of the four main printing colors (blue, magenta, yellow and black). These colors can be mixed in varying percentages to create tonal values in the final image. –each of the four plates (now on a cylinder) is installed in a 4-station printing press, each station printing its own particular color, and feeding the paper through to the next color station. When the four colors are combined, the final multicolor image is complete. Nowadays, multiple printing techniques are often employed for one single stamp issue. A stamp design may have some engraving, some lithographic printing, embossing and foil stamping. The design of the stamp image can be partly done by hand or on a computer. Together, all these different methods add to the beauty and variety of the stamps printed. They also make a stamp issue more difficult to counterfeit. Modern printing techniques are constantly evolving. The basic principles of engraving and lithography have been described in these articles, but new techniques, machines and the introduction of computers can alter the production method. We hope that you have enjoyed this series. It’s great to know that the combination of the printing strategies have made it harder for the design to be imitated. I guess this is the reason why my sister wanted to buy lithographic prints because she wants her house to be uniquely decorated. She just moved in a month ago, and she just finished unpacking and placing stuff. Now, she is on the hunt for house decorations, and this is one of them.